Thankfully the days are gone when British boxers who travelled to the United States either got mugged in the ring by American opponents or robbed outside it by the judges. America is not the hostile territory it once was for our champions and contenders, who now seem to win there more often than they lose. Years ago defeat was the norm for Brits who made the journey, such as middleweight champions Randolph Turpin and Terry Downes who won their titles here but came back from the US as losers after their respective return bouts against Sugar Ray Robinson and Paul Pender. There are plenty more examples of glorious – and sometimes inglorious – defeats Stateside for our combatants in an era when it was said of fighting the Yanks on home soil that you needed to knock ‘em out to get a draw! Not any more. In more recent times there has been something of a Transatlantic sea-change. British boxers are looking up in America – and I don’t mean from the canvas! Nigel Benn, Lloyd Honeyghan, Ken Buchanan, Naseem Hamed, Lennox Lewis, Chris Eubank, Carl Froch, Kirkland Laing and Danny Williams (the London heavyweight who brought down the curtain on Mike Tyson’s career in Louisville) have all won there; Joe Calzaghe did so twice, against Roy Jones Jnr. and Bernard Hopkins. One of the most recent results came last year when Kell Brook took the IBF welterweight title from US holder Shawn Porter in Carson, California on a majority decision. Ironically, two American judges scored in his favour while an imported British judge called it a draw. Similarly last weekend in Texas Doncaster’s Jamie McDonnell claimed a close points victory when defending his WBA bantamweight title against Japan’s Tomoki Kameda despite a suffering a third round knock-down. No anti-British bias there. Nowadays British fighters seem to get a fairer deal from the judges in America than they often do elsewhere, especially Germany. All of which should be of some comfort to DeGale, who has had to travel to Boston (scene of Downes’s defeat 53 years ago) tomorrow night to challenge Michigan’s Andre Dirrell for IBF super-middleweight title Froch has vacated. The only jinx that should concern him now is that no British Olympic champion has ever progressed to a world professional title. That medal seems more like a millstone. Personally I always prefer to have home advantage but the Americans blew his British promoters out of the water with a $3.1m bid from Warriors Boxing, who represent Dirrell, the purse being split 50-50 between the fighters. Dirrell, a rare American medallist in recent Olympic Games (he won a bronze at Athens 2004) certainly did not relish coming the UK, as he remains convinced he got the rough end of a split decision against Froch in the Cobra’s Nottingham backyard in 2009. Yet this is a winnable fight for DeGale if he uses his nous and the right tactics. He has to pressure this guy, a fellow southpaw who likes to switch hit. He can’t stand back and try to pick him off as he used to do in the past. He has to make all the running. DeGale has looked good in his last couple of fights and with the bout starting at around 5pm local time he has the incentive, and the ability, to turn this British expedition into a Boston glee party. 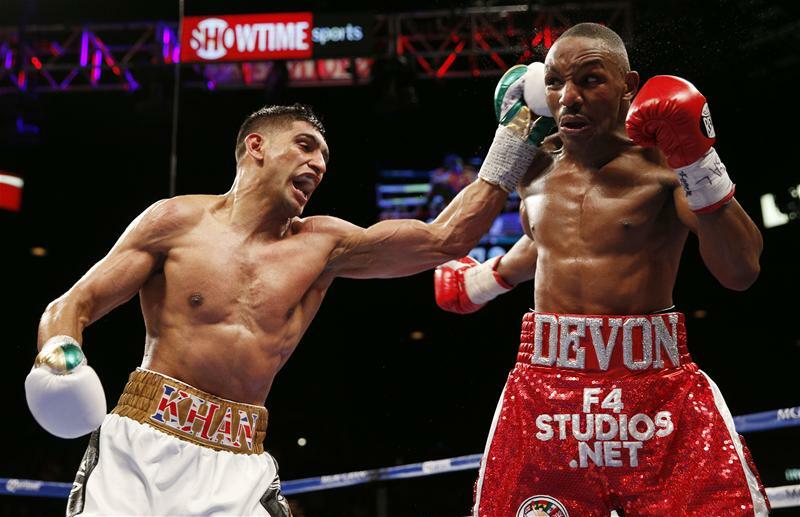 Another top British fighter who has found winning ways in America is Amir Khan, and the probability is that he will do so again in New York next Friday night when he faces home-towner Chris Algieri in a BoxNation-televised welterweight scrap. Algieri lost his 21-fight unbeaten record on points to Manny Pacquiao last time out, surviving six knock downs. While he doesn’t seem to have the dig to trouble Khan’s supposedly fragile chin, he can box a bit. Khan will be out to do what former stablemate Pacquiao couldn’t and put him away put him away to reinforce the message that he awaits Floyd Mayweather’s pleasure should the Money Man be ready to fight again once he has finished counting his cash from hitting the all-time jackpot in Las Vegas. No doubt whom is the most popular fighter in the US at the moment –and he isn’t an American. Even though he hails from Kazakhstan you would have thought Gennady Golovkin was a native of Kentucky the way the American audience of 12,000 cheered him as he thrashed one of their own stars, Willie Monroe, to retain his WBC middleweight title at the Inglewood Forum in Los Angeles last weekend. 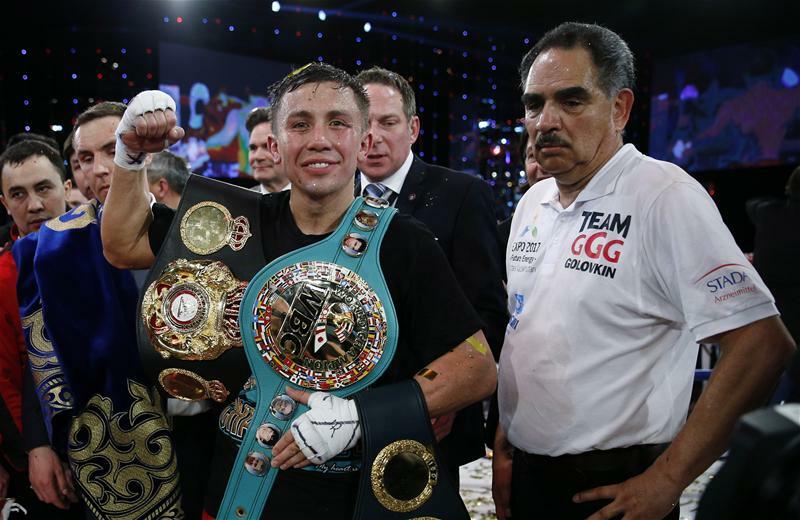 It was Golovkin’s 20th straight stoppage victory. He demolished the rated Monroe in six rounds, punching like demon. They love Golovkin over there. He’s a colossus with clout, and a charmer outside the ring who has now made his home in California and speaks good English. He deserves to be rated at the top of boxing’s pound-for-pound list. He is 33, but maybe that is the new 25, and like the Americans I rate him as the most exciting fighter in the world today. You can understand why. Triple G, as they call him, is pure brilliance. Until a few fights ago ago he was boxing shrewdly, slipping punches. But his ploy is that if no-one seems to hurt him, he’ll shrug off a couple of shots to land his bombs. He really did a job on Monoe, a decent fighter, walking right through him. Golovkin hurts people even when he doesn’t mean to knock them out. Ask British opponents Matthew Macklin and Martin Murray, who will testify that Gennady’s setup shots are as solid as his full-strength blows. Personally I’d like to see Golovkin move down and maybe take on the similarly destructive Mexican Saul ‘Canelo’ Alvarez. Whatever, that would be a blockbuster and certainly give the fans what they want. On the LA undercard was another thrilling hitman, Roman Gonzalez, a three-weight world champion they have dubbed “El Chocolatito’. He blitzed Mexican Edgar Sosa inside two rounds to keep his flyweight crown, his 37th stoppage victory in 43 fights. Gonzalez comes from Nicaragua, home of another tremendous fighter, the late Alexis Arguello. Believe me, this kid is sensational. British music legend Paul Weller added a nice touch to his latest album Saturns Pattern in which he dedicated it in loving memory to my late matchmaker Dean Powell in the credits. Dean was well known for being a current-day Mod and Weller, the Modfather, was one of his idols as well as a close friend. Great songs in memory of a great fella.